Tennis is full of surprises and especially in terms of Elite Gender Inversion (EGI). As the new trend of pregnant female tennis players well demonstrate*, nothing is off limits when it comes to deploying the EGI agenda and test the public. Most of the audience are not aware they are being put through any form of test when they indulge in the game deployed on the various arenas – but in terms of performance it seems a big part might be won outside of the courts and rather fought on the testing grounds of EGI and its occult progress (or not). A rather curious image came across my screen while looking at images from tennis prize ceremonies. As with other sports, tennis is also practiced by individuals with disabilities, something i didn’t ignore but was quite unfamiliar with. 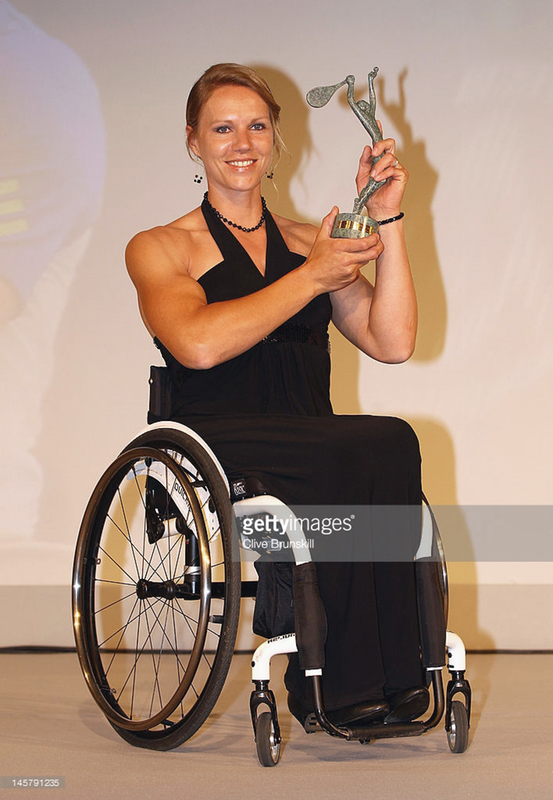 By popularising a sport such as tennis it is not uncommon that the biggest champions unite in special events and celebrations where the Elite decorate their hero victors and thus also its Paralympic champions like Esther Mary Vergeer from Holland who has won 7 Paralympics titles, 42 Grand Slam tournaments and 22 year-end World Championships. An impressive record certainly, but i was initially stunned by her build which was so massive together with a face so uncommon for natural woman (or cis-female in these days of LGBQT+). The wheelchair can very well explain away much of the male muscular appearence of Vergeer for sure. However, her underlying skeletal structure combined with wide and prominent facial features are nevertheless uncommon in regular females, regardless of the Dutch champions unfortunate handicap tying her to a wheelchair. The fact the Elite have proven to be so overly deceptive on just about everything gender-related made it difficult to treat Vermeer any different from any normal tennisplayer – which might be borderline to weird, i admit. Regardless of my apprehension, it soon became clear there really were many reasons to suspect Esther Vergeer playing part in the long history of tennis transgenderism. Similar to the more mediated stars she frequently appear alongside in numerous venues and ceremonies – tennis seems always to turn out a racket. To suspect individuals with paralyzed legs is in itself quite unsettling, but it would be even less satisfactory to stand down from any objective observation out of a hypocritical sense decency. As common members of society we have all been victims since childhood of a hierarchical system that in no way has displayed any respect or consideration for our values as a people nor our natural right to lead truthful lives on the lands we were born onto. Images can of course be deceptive, but when there are thousands of high resolution images and vast quantities of live TV footage – there is no longer any photoshop artist that can conceal the factual appearence and physical characteristics of any celebrity or athlete. The Elite might act behind the scenes with plastic surgery, hormones, braces and supports, makeup, clothes and fake hair – but when celebrities or athletes go on camera – they are all bound to the limits of 30 frames each second that still today proves impossible to be altered altogether in order to dissimulate anatomical traits such as wide shoulders or lacking hips. When evaluating the reasons that would motivate the Elite to not even let disabled athletes be left alone, it must really boil down to their ambition for power and control. Without total control there is little meaning the word control in the first place – there is no control when control isn’t total – and in tennis this clearly implies the Elite even providing the leading athletes in wheelchair tennis. At least that would be the case with sevenfold Paralympic Champion Esther Vergeer, who in my opinion can not be a natural born female as she falsely present herself as being. This is imposture, and while not being in a position to judge Vergeer’s disability, i still try to keep Stevie Wonder in mind as an example whenever i try to imagine a limit to the Elites bald deviousness – and there seems to be none. •Male type musculature, impossibly wide shoulders (regardless of handicap and wheelchair use), huge hands, long arms, long neck, big head, wide facial features – large chin, deep set eyes, bony brow ridge and sizeable mouth.